Retirement planning is an integral part of complete and holistic financial planning. 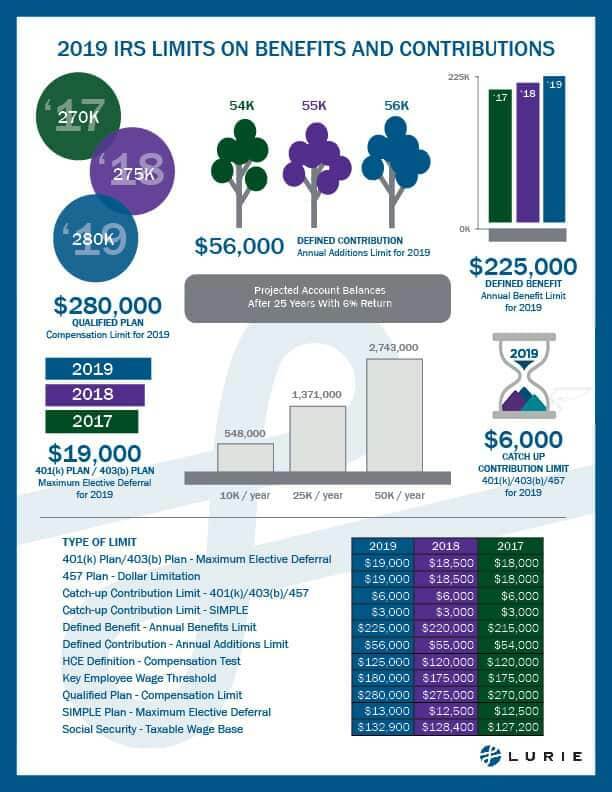 Lurie’s retirement plan consultants in Minneapolis custom designs and administers qualified retirement plans that help small to medium-sized business owners and employers reduce their current taxes, increase their retirement savings, and attract and retain their employees. In our pursuit of providing smarter, more strategic Retirement Services, we partner with Financial Advisors, Accountants (CPAs), and other Third Party Administrators (TPAs) and help them customize a design that meets the business owner needs. We offer highly experienced and forward-thinking retirement plan experts that will help determine whether a 401(k) Profit Sharing Plan, a Cash Balance Plan, or a combination of the two will be best suited for each individual situation. We provide complex retirement plan design, consulting, administration and actuarial services to over 500 qualified plans, and our clients are located throughout the country. Our consultants have earned industry designations through the American Society of Pension Professionals (ASPPA), the Society of Actuaries (SOA), the National Institute of Pension Administrators (NIPA), and the Joint Board for the Enrollment of Actuaries (JBEA). We attend industry conferences and keep current on legislative changes so that we can provide you with the highest level of service. The chart below outlines the basic features of available plan options. Sometimes the optimal solution requires a combination of plans. Our Retirement Plan Consulting Group can review your situation and recommend the right plan design for your company. Cash balance plans are a solution for business owners looking to maximize retirement savings. A cash balance plan is a type of defined benefit plan that offers many advantages to employers. The easily understood benefit formulas and flexible plan design make it an ideal retirement plan to attract and retain top talent. When the proper care is taken during the plan design process, a cash balance plan is easily manageable with a firm such as Lurie to administer your plan. Whether a cash balance plan is right for you depends on your particular situation. Lurie will include an illustration, based on your numbers, as part of a proposal for Third Party Administration services. What is a Cash Balance Plan (CBP)? A Cash Balance Plan (CBP) is a type of defined benefit plan that looks and feels more like a profit sharing plan. The benefit of a Cash Balance Plan is that employers who sponsor them are generally able to deduct much higher contributions than they can with a 401(k) Profit Sharing Plan alone. What type of business can establish a Cash Balance Plan? A Cash Balance Plan can be set up for any type of business, including corporations, sole proprietorships, and partnerships. How much can I contribute to a Cash Balance Plan? Contributions to a Cash Balance Plan are based on age and compensation. The IRS has set up benefit limits so that an individual can accumulate $2.8 million in a Cash Balance Plan by age 62. Annual contributions are determined based on age, income and investment performance in the plan. Can I still maximize my 401(k) Profit Sharing Plan if I set up a Cash Balance Plan? Deductible contributions to a 401(k) Profit Sharing Plan may be limited if you establish a Cash Balance Plan. Generally, you will be able to contribute the $19,000 ($25,000 for those over age 50) 401(k) deferral limit plus an additional 6% discretionary profit sharing contribution. However, your contributions may be limited if you are participating in a 401(k) plan sponsored by another employer in the same year. When are my contributions due to the plan? Annual contributions are due by the earlier of the due date of the business tax return, with extensions and 8 ½ months following the end of the plan year (September 15 for a calendar year entity). Each year, once your income is known, Lurie’s actuarial team will calculate a deductible contribution range. As a plan participant, you will have a “Hypothetical Account” that is credited with a pay credit and an interest credit each year. The pay credit is typically a percentage of your income and the interest credit is generally between 4% and 6%. Are contributions required every year? Generally, yes. Annual contributions are required and the amount is determined by an actuary. As long as there are not large fluctuations in investment performance and annual income, the contributions should not fluctuate much from year to year. As a plan trustee, you can work with your investment advisor to determine the best investment strategy. You will want to keep in mind that the account should earn a moderate rate of return to match the interest credit in the plan (4%-6% annually in most years). Widely fluctuating investment returns will have an impact on your annual contributions. What happens if I hire an employee? Most plans have a waiting period before an employee becomes eligible for the plan. It will be important to let Lurie know when you hire an employee so we can evaluate if plan design changes are needed once he/she becomes eligible for the plan. Can my spouse be included? Absolutely. If your spouse is working in your business and earning a salary, he/she can be included in both the 401(k) Profit Sharing and Cash Balance Plans. This may give you an opportunity to contribute even more on a tax-deferred basis. Cash Balance Plans are a type of defined benefit plan, which are required to follow a Permanency Requirement. However, there is IRS guidance that states that a plan may be terminated for a legitimate business reason. A few examples include business restructuring, a change in law affecting qualified plans, the substitution of another plan and financial hardship. What happens if the plan is underfunded at plan termination? Typically, you will have two options if the plan is underfunded at plan termination: make an additional contribution to cover the shortfall or waive your benefits to the extent that the plan is underfunded. At Lurie, we will work with you annually in determining your contributions to make sure that the plan does not become underfunded. However, there may be unforeseen circumstances that require you to waive benefits at plan termination. What happens to the plan balances at termination? Cash Balance Plan assets are qualified plan assets that are eligible for annuity payouts at retirement or lump sum distributions that can be rolled over to an IRA or 401(k) Profit Sharing Plan. Contributions to a Cash Balance Plan are usually required each year until the plan is terminated. The IRS requires the plan is established with “permanency” in mind. Contributions may fluctuate from year to year based on the plan’s investment return. It is important to work closely with your investment advisor to set up the proper mix of investments in an attempt to avoid any unwanted fluctuations in contribution levels. As a business owner, you are most likely looking for ways to accelerate retirement saving over the next several years. Consider the opportunities a well-crafted retirement plan can offer. Lurie designs retirement strategies aligned with your tax and savings goals. Using qualified plan design, and third party administration expertise, we analyze the choices you have, focusing on least cost/highest savings potential options. Our technical administration and support services enhance smooth follow-through once your design is in place. Which of the following describe your retirement plan goals? We take the time to understand your business and personal situation, based on employee demographics and salary mix. Lurie specializes in third party administration. Using a flexible service model and efficient processes, our team provides annual plan administration services to over 500 plans. We work in close cooperation with your investment advisor, and others involved with the service of your plan, to streamline completion and delivery of your retirement plan. Lurie comprises actuaries and retirement plan professionals. We understand the regulatory complexities governing retirement plans, and can support you through the entire process of plan design and ongoing administration.